Geek Goddess: MacBook Air ... you want one? Can U Handle it? MacBook Air ... you want one? Can U Handle it? Perhaps I'm not your conventional Mac-User. I love the Mac, but really for it's OS. Yes it's pretty but I'm not the one to swear by it and act all "cultish". Welcome to the world of competition. Can't believe what you're seeing? This is the LENOVO X300, hasn't it really lightened up by a lot? The X300 represents a milestone in the ThinkPad series. A departure from its staid-looking brethren, Lenovo's latest ThinkPad crams all the regular features of a full- featured laptop into a form factor so thin it could fit into a Manila envelope. Yes, that's a feature much touted by Apple's MacBook Air, too. Although both notebooks flaunt ultraportability as a wow factor, each resides on the opposite side of the spectrum when it comes to features and style. 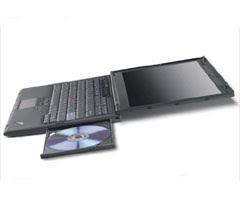 For starters, the X300 doesn't sacrifice function in the name of thinness. It has a webcam, full-sized keyboard, built-in DVD burner, Gigabit Ethernet port, graphics and audio ports and three USB ports. Connectivity options include Bluetooth, WiFi, and the new wireless USB standard. Unfortunately, Lenovo has chosen to exclude 3G, GPS and WiMax in the X300 configuration sold here. There's an extra set of mouse buttons to cater to those who prefer to use the TrackPoint instead of the touchpad and a fingerprint reader. This machine sports an Intel Core 2 Duo processor running at a steady 1.20GHz. It won't break any speed records but it provides ample performance for run-of-the mill office, Internet and multimedia applications. One of the key features of the X300 is the use of a solid-state disk for storage. Compared to a conventional hard disk, a flash disk is more rugged because there are no moving parts. It also supposedly consumes less power and increases performance. As a demonstration of this, the ThinkPad takes a zippy 35 seconds to boot up on average. It manages 3.6 hours under regular use with a three-cell battery. You can choose to fit it with an extended battery and replace the DVD drive with another battery to extend battery life to a maximum of seven-and-a-half hours. The ThinkPad's screen performance suffers when used outdoors. Although it employs the same LED-based technology as the MacBook Air, its matte screen seems dimmer than the Air's glossy screen, even when brightness settings are at maximum. The X300's stereo speakers deserve a mention. For a laptop so thin, it churns out loud audio from movie DVDs or music. However, if you think I'm sold by the Lenovo X300, the truth is that in terms of style, the MacBook Air wins. For example, the X300 illuminates its keyboard with a manual switch that turns on a light from the top of the screen — very much like your standard desk lamp. The MacBook Air senses ambient lighting in your surroundings and its backlit keyboard glows automatically when it's dark. Now, which one would you prefer? The main bugbear with the X300 is the premium ($4,799) - yes there is a huge price differential! You have to pay for the flash-based drive because Lenovo doesn’t offer an alternative configuration with a conventional drive. Its processor could use a bit more muscle, too. The MacBook Air’s lack of features might put a blip on your radar but its desirability, which goes beyond its svelte and clean aesthetics, is undeniable. Both are worthy contenders, but corporate drones might prefer the full-featured X300. The main difference, from the spec sheet you provided, is that the X300 boasts a solid state drive, built-in dvd and stereo speakers. I'm not sure if all that is worth $2000 extra. I've tried out the MBA and it's not as fast as it feels. I don't think I will sacrifice speed so I can use a manila envelope to carry my laptop around. And overheating issues are causes for concern. I would prefer the MacBook Air if to choose between both. Love the Mac OS more than Windows. But I still find the MBA overpriced cos paying the same can get a better MacBook Pro.